New Delhi, October 22, 2013: As the country readies to celebrate Diwali, Dish TV, Asia’s largest and the country’s premier DTH service provider, in yet another move to engage with consumers, announced the launch of two special and thrilling offers to brighten its customers’ Diwali. This year, Dish TV will provide whopping Rs. 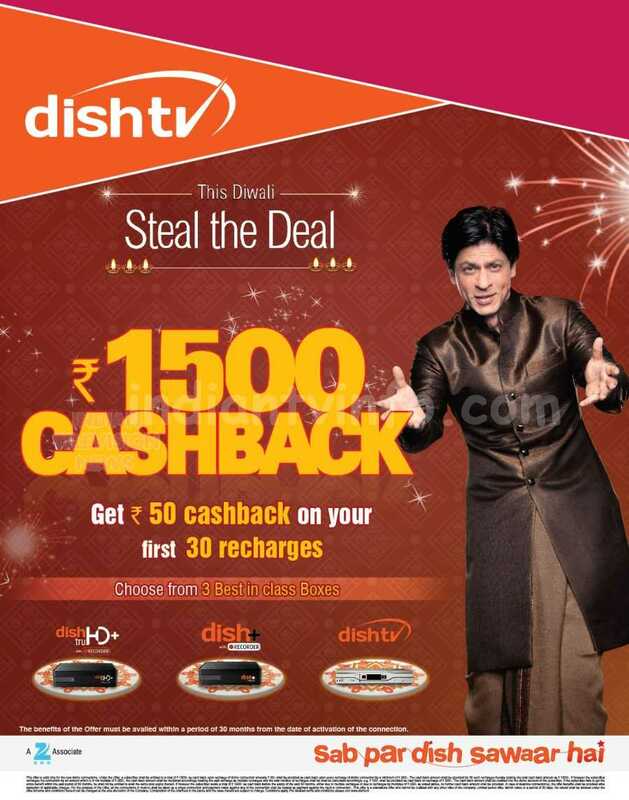 1500 Cash Back on purchase of any Dish TV set top box. This offer is applicable on the purchase of either a Standard Definition (SD) or a High Definition (HD) box. In addition to this incredible offer, Dish TV has also announced the Ultimate Combo Offer that will help consumers earn a free standard definition box with the purchase of every high definition box. The Ultimate Combo Offer will also give away a substantial discount on monthly recharges besides the free second set top box. Through this offer, Dish TV plans to address the needs of multi-television households with this terrific cost effective solution. Customers can avail only one of these offers at a time. Consumer sentiments are buoyant during the festive season and they tend to splurge more. Keeping in the mind the festive fervor, Dish TV plans to cash on this opportunity with attractive consumer promotion offers. The two Diwali bonanza offers will be available with effect from October 18th 2013. While both these offers will be available across 42 cities that have been digitized under the phase I and phase II of the digitization drive, the Cash Back offer will be available across all cities in India. The digitized cities include names such as New Delhi, Mumbai, Kolkata, Chennai. Agra, Ahmedabad, Allahabad, Amritsar, Aurangabad, Bangalore, Bhopal, Chandigarh, Coimbatore, Faridabad, Ghaziabad, Howrah, Hyderabad, Indore, Jabalpur, Jaipur, Jodhpur, Kalyan-Dombivli, Kanpur, Lucknow, Ludhiana, Meerut, Mysore, Nagpur, Nasik, Navi Mumbai, Patna, Pimpri- Chinchwad, Pune, Rajkot, Ranchi, Sholapur, Srinagar, Surat, Thane, Vadodara, Varanasi and Visakhapatnam.